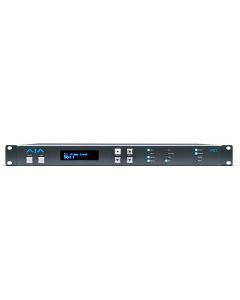 Featuring a flexible input, output, and control architecture, the FS1 Universal HD/SD Audio/ Video Frame Synchronizer and Converter can simultaneously work with both HD and SD video all in full 10-bit broadcast quality video and 24-bit audio. Supporting virtually any input or output, analog or digital, HD or SD, FS1 can up or down convert between SD and HD, and provide simultaneous HD and SD outputs. Up, down, cross conversion between HD formats are also supported, with simultaneous output of both formats. Power: 100-240 VAC 50/60Hz (Dual, redundant power supplies), 25W typical; 30W max. 15A max.